A composed color palette of whites and variation on green unified the warm candlelit space of The Bell Event Centre for this St. Patrick's Day wedding. 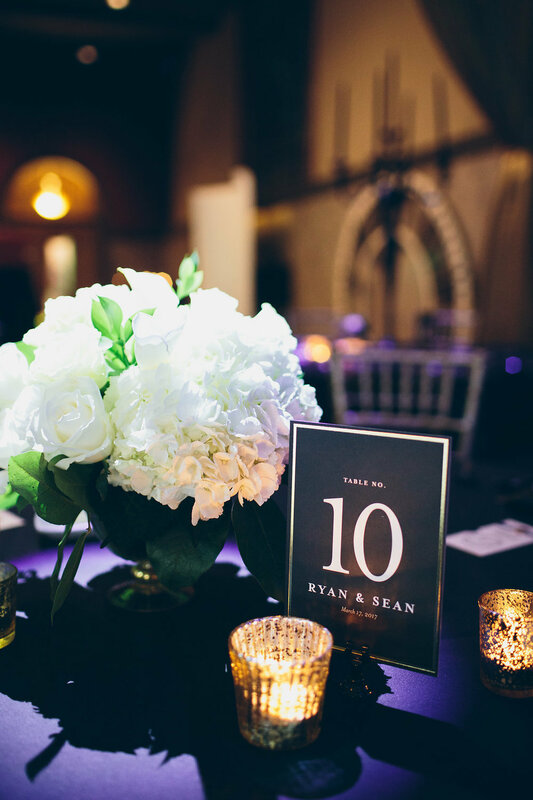 The floral centerpieces reflect the light and seem to glow in the dreamy Romanesque space. For the arrangements we used a mix of robust white roses, calla lilies, hydrangea and snapdragons interlaced with hardy lily foliage and the painterly schefflera. Vaulted ceilings dramatically lit from the floor, 100 year old stain glass windows, and candles upon candles were the design elements that inspired the florals for this Bell Event Center wedding and reception. Originally St. Paul's Church, both the interior and exterior is stunning with its expansive nave, original murals that draw the eye along the walls and the handcrafted terrazzo floor.